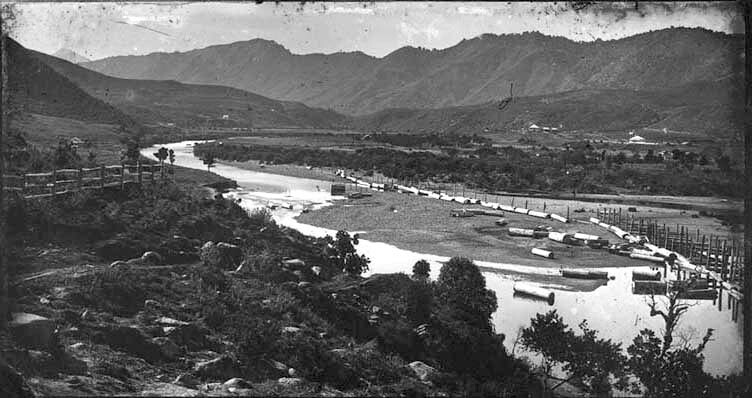 Many will descend from families who settled up the Kauaeranga Valley. Farming, growing vegetables and grapes, involved with bush work and other activities. 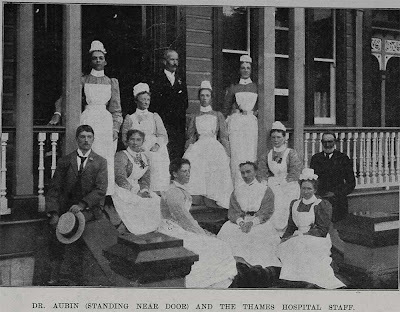 The focal point for many, the Kauaeranga Hotel (1880s-1945) and during the later years of the 1890s the Thames Orphanage was also in the valley. Residents of the valley, often have stories about their adventures around the Water race and the temptations of walking along the fluming. 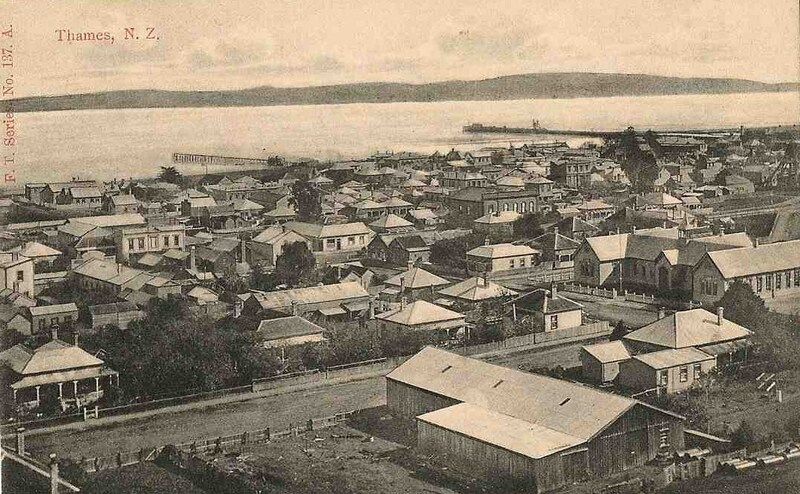 There are several ORAL HISTORY recordings by residents of the Kauaeranga Valley, that give details on the BARKER, DEVCICH, MCPIKE and VOYKOVICH families..along with the mention of many other names. At Archives Auckland, there are also files that give examination details. An example above, is part of the 1911 results for Kauaeranga Valley School. Surnames mentioned on the page are: LAW, MACKIE, TAYLOR and WILLIAMS. One of the many schools at Thames, was the KAUAERANGA BOYS SCHOOL. Remember in the 1870s there was the Kauaeranga Girls school In Richmond Street - the Boys School also was in Richmond Street, operating out of the Volunteer Hall. A 'letter to the Editor' in the Evening Star 15/1/1875 from a concerned Thamesite gives some details on the school. Rev BROWN was in charge of the school and was planning to operate it as a common and superior school. The superior or high school to offer an extended range of classes. At the end of 1875, Rev MARK was head teacher, when he resigned the replacement was Mr FIELD. January 1877 Mr Herbert MASON was in charge, followed by the appointment of Mr G N PHILLIPS in March 1877. In 1877, land for for a new site for school was secured and a notice regarding the filling in of the lots at the corner of Sealey and Baillie Streets was placed in the paper 22/3/1877. On the 25/4/1877, the paper reported that a new school building was to be erected for the Kauaeranga Boys School, as the Volunteer Hall was most unsatisfactory especially in winter. The building was erected shortly after given that on the 30/6/1877, tenders were being asked for the painting of the new school. On the 20/4/1878, it was reported that the attendance at the school was over 400. Some alterations were made to the entrance and new equipment provided. Alterations also included fixing all the desks to the floor! "Kauaeranga Boys' School, which was formerly known as the Kauaeranga Baillie Street School, was established about 1870, and is said to have been the first school on the Thames. The building has six class rooms, with headmaster's and teachers' rooms, and appropriate vestibules and lavatories. It has accommodation for 450 children, has that number of names on the roll, and the average attendance is 405. The headmaster is assisted by eight certificated teachers and two pupil teachers." Several sources say that in 1912 the school's name was changed to BAILLIE STREET SCHOOL, although an earlier mention is made in the paper 23/12/1898. 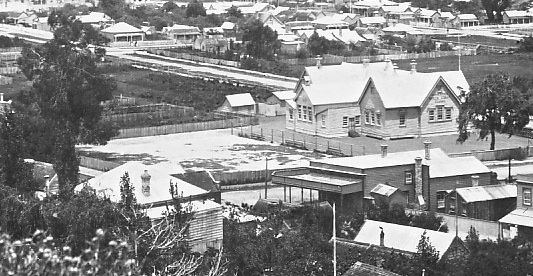 It states that the school is to be known from that time as the KAUAERANGA BAILLIE STREET SCHOOL. In 1912 the state of the building was poor not helped by bad drainage in the area. the Education Board proposed that it be closed. (Thames Star 4/10/1912). The "breaking up" prize giving for the school was held in the Central Hall December 1912, the school officially closed in 1913. The final committee details are in the paper 14/12/1912. Most of the pupils were enrolled at the Parawai School (South school). This influx of pupils was partly responsible for the need for new building at the Parawai School, which resulted in the building of the new Infants' Block in 1915. The High School moved to the site of the old Kauaeranga Boys school, on the site where it is to this day. School records are available for the school, and they reveal that both boys and girls attended the school (Similar to the Kauaeranga Girls school that had a mixed roll). During Heritage Week, a lecture series is being held at The Treasury, Queen Street, Thames. Monday 12 March: Hone Werahiko - Honest Prospector by Dr Philip Hart. Thursday 15 March: Computers and Research by Jan Gow Q.S.M. The programme details for next months THAMES HERITAGE WEEK, are being released. A media statement today outlines over 40 events. “It’s going to be another full program this year in Thames for their Heritage week from the 9 to the 18 March with over forty events including guided walks, men’s shed tours, markets, cooking demonstrations, dinner theatre, music and entertainment,” says Rex Simpson, co-ordinator of this year’s event. The programme outline is available at theTreasury Website and Heritage Website. One of the displays,will be the Thames Hospital Historical Photographs Collection - that used to line the corridors between the two ward blocks. A new article in The Treasury Journal. 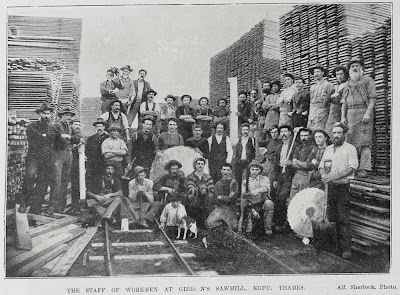 This is a very comprehensive article covering the history of sawmilling all over the Coromandel Peninsula. The bonus being a wonderful collection of photographs. A reminder that there are 3 wonderful oral history recordings by the Managh family of Thames, regarding the history and their involvement with the Thames Sawmill at Kopu. These are available at The Treasury, Thames. A new article is online in 'The Treasury Journal' that covers some of the findings recently discussed on the Tararu Cemetery, Thames. Entitled: "Tararu Cemetery - what stories and secrets does it hold?" The document covers: background, history, land ownership, summary of key events to 1920, burial records and ongoing issues. 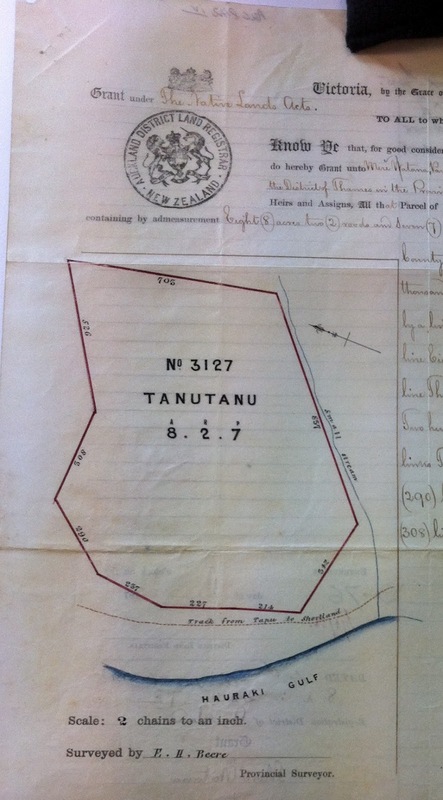 Part of the land deed is shown below for the Tanutanu Block - which was purchased from the Maori landowners, for the Tararu Cemetery. Remember if you have a story to tell about the Coromandel Peninsula area and the early settlers, Contact the Editor of the Journal.